I was on the edge of my seat - for 12 hours. We were driving from Montana to southwest Washington to visit family and friends over a long weekend. 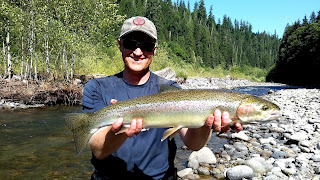 I was going to be steelhead fishing the next day, back in familiar territory from nearly a decade ago now. 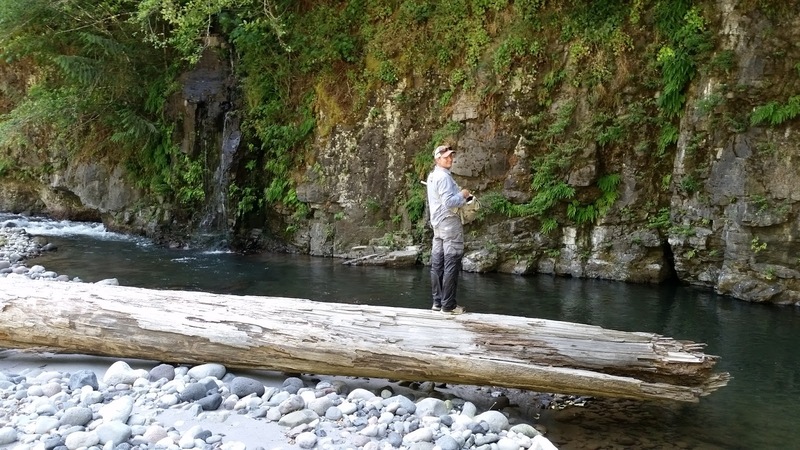 I'd lived there for six years and had fallen in love with steelhead in small streams. Since then I've been back for them only once. I hoped that I'd get the opportunity to tangle with one. I only had a single day to try. 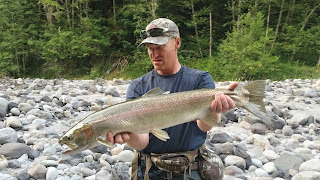 And steelhead - well, if you've fished for them you know - can be like hunting for sasquatch. Elusive. Seemingly impossible, nonexistent. Like elk hunting - you wander the hills for days and question your own sanity until suddenly you are into them with nonstop thrilling action. Much like that hour-long line at the roller coaster for a 90-second ride. But I'd be fishing with one of the best friends I've ever had. So really, catching one would be icing. Joe and I met when we were both in our 20's. One of us turns 40 this year. I do not entirely remember the sequence of events under which we met, those piddly details are overshadowed by the fishing adventures that began almost right away. On top of that our wives became good friends and the four of us spent lots of time together. Joe and I endured their wrath [loving tolerance?] whenever a fishing trip resulted in returning closer to midnight than suppertime. "Are you serious about fishing in the morning?" "No," I said, "Just joking." "Okay, I'll give you a hug then." Wherever I have lived and fished in my life I have always seemed to leave behind a trail of disgruntled wives. On this day-trip Joe and I came rolling in somewhere near 11pm. Barely an eyebrow was raised, so somewhere along the way people have at least gotten used to us. We met in the morning shortly after 6am. Our start time was limited by the opening of the establishment where I could purchase my license. We tossed our gear into his pickup truck and then loaded the four-wheeler on to the back. The thought was to use it to access some more remote areas. But in the end what it actually did was allow us to bite off way more creek then we might have fished without a shuttle and ensure that we would be home just as late as ever. After an hour of rolling through the hills over familiar logging and forest roads we parked the truck at a spot we knew we didn't want to miss. We still had not formed a plan exactly, but there was no one on this stretch and there's a hole here that's as close to a sure thing as we know to exist in steelhead fishing. And sure enough, less than an hour into the day, years spent learning this creek paid off when time was limited. Thirty three and a half inches of steelhead came rocketing out that very hole after both of us had already drifted through it several times. It could have taken either of us, but apparently it had been my drift that had achieved just the right elements of depth and steelhead magic. The fish blasted into the air in three full-fledged jumps before disappearing into the depths and tucking under the ledge on which we stood. It stayed down there methodically moving upstream and down. Then it went on a blistering run to the head of the hole before turning and shooting down to the tailout, 45 yards away. The bow in the line raced across the water slicing through the surface. And then, as so often happens, the fight turned into a chase when the steelhead darted through the rapids and down towards the next hole, peeling line like an unraveling cartoon sweater. I followed along weaving my rod tip over the rocks and under the limbs it had passed by. It was very satisfying when several minutes later I locked my thumb and forefinger around his tail, cradled his belly in my other hand, and lifted him out of the water. What I had hoped might happen somewhere during this day had already occurred at the very beginning. 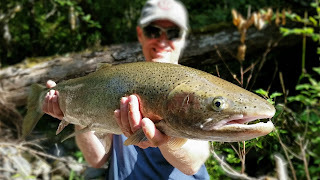 The steelhead itch was scratched, but it wasn't really gone. An hour later we were back at the truck having finished the initial stretch of water. On the hike back we had discussed what to do next. We unloaded the four-wheeler and set our rods in the gun rack. We decided to go see if we could find a spur road I had scouted in the past and we've used only a couple of times. It would take us back down to the river leaving several miles between us and the truck. After one dead-end spur and eight miles of riding later we came to a washout where a bridge had previously been. We knew this was the right spur, so we decided to ditch the four-wheeler and hike the rest of the way to the river. It cost us more time but was certainly the right decision for setting us up for a solid day of fishing. Fish number two came a few hours later when the smallest steelhead of the day hit almost immediately on the first cast into a long, shallow, shaded hole. This fish fought ferociously and sped downstream quickly. It wore itself out and the fight came to an end far sooner than the first, but much further away from where it had started. Again, this fish had been on my line. Like before, it could have been either of us. Having now caught two fish and exceeded my expectations by double, we quit leapfrogging and I hung back. Joe took lead and made most of the first casts into each of the next holes. Joe had been the one who got me started in steelheading and coached me into my first catch back when I was just a padawan. Now I was watching the master work the stream with his 11.5-foot rod. We fished some beautiful water. Although in the summer low with snow melt essentially gone, there was ample flow with gorgeous green depths and the slightest hint of glacial cloudiness. The river changes every year - new holes created, old holes filled, channels abandoned, new ones carved. Yet some holes never seem to move, anchored by exposed bedrock or some less obvious geographical feature. Familiar holes greeted us and new gems were there to discover. 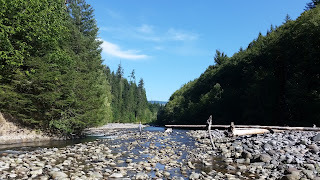 Ancient old-growth logs dotted the riverbed. Occasional waterfalls were spilling off the stream banks. Tall and broad sword ferns swallowed the floor of the surrounding forest. Eruptions from the Pacific Northwest's tumultuous past were displayed in cut banks. The cobbles we walked on were sourced from a mix of older mafic lavas, and to a greater extent, more recent felsic magma explosions. Occasionally we saw a steelhead move to intercept our offering - or maybe move away from it. By the time we were deep into the afternoon we had encountered four or five steelhead for the day. Statistically, that's pretty good. I have had plenty of days on this stream where I was begging for one hit. On the opposite end of the spectrum I've had days, maybe just one day, where I hooked and landed a dozen. If keeping hatchery marked fish (those clipped as fingerlings before journeying to the ocean), reaching a limit of two in a day can be quite the feat. Eventually the moment came when Joe lifted his rod into resistance. It didn't budge, and after a few seconds of solid tension he dropped his tip assuming it was yet another snag. 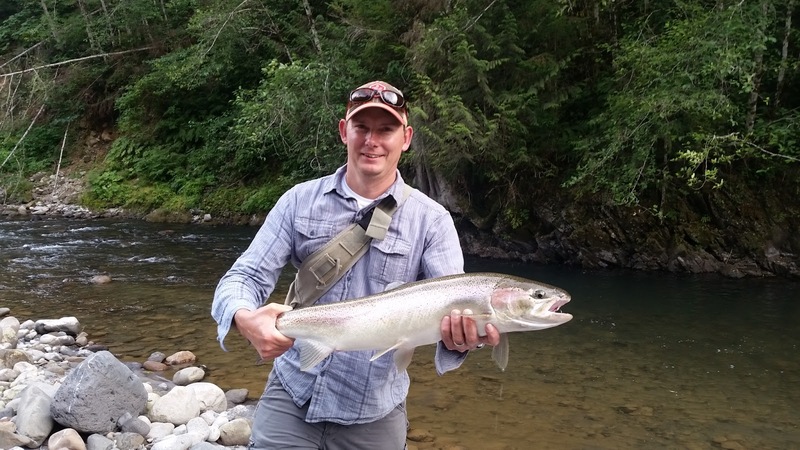 Steelhead almost always take off immediately in a supercharged kind of way. Sitting still and not budging is just not expected. He changed position in an attempt to free it like a hundred times before and the next time he lifted his rod the fish came to life. It's the kind of moment you relive over and over and wish you could take back and do differently. There'd been no hookset, and it was off in two or three throbs. I stood next to Joe and commiserated while he resituated his rigging. Almost mindlessly I started drifting my own casts through the hole. In general after touching a fish, a narrow little hole like this would be spooked and done. Joe started describing to me what the hit had been like - a slow stop, no movement or tugs. As he is describing this my own line starts playing out the same events. I lifted into solid, motionless weight - then, on a hunch, lifted higher. 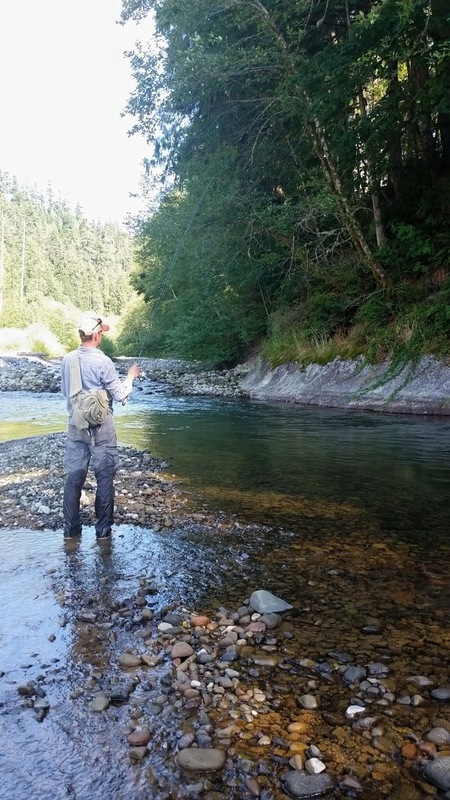 At the suggestion of a long linear flash beneath me, I set the hook into a third steelhead. It throbbed and rolled and started peeling drag like a tank. It ran the extent of the hole, then came back, then did it again. It never jumped. Unlike typical steelhead, it bulldogged it's way to the bottom and held tight, camping out much like a big brown trout will sometimes do. It moved almost slowly. Its runs were short and surgingly powerful, each one initially explosive. I had to keep the drag dialed way low and palm the spool. With the short, measured runs it didn't wear itself out and the battle lasted a long time - sometimes as more of a standoff. This fish went 31 inches on the tape and its girth and bulk dwarfed the second fish, which had been a more standard steelhead in this system. The first fish had been a magnificent buck. This one was a gorgeous hen. 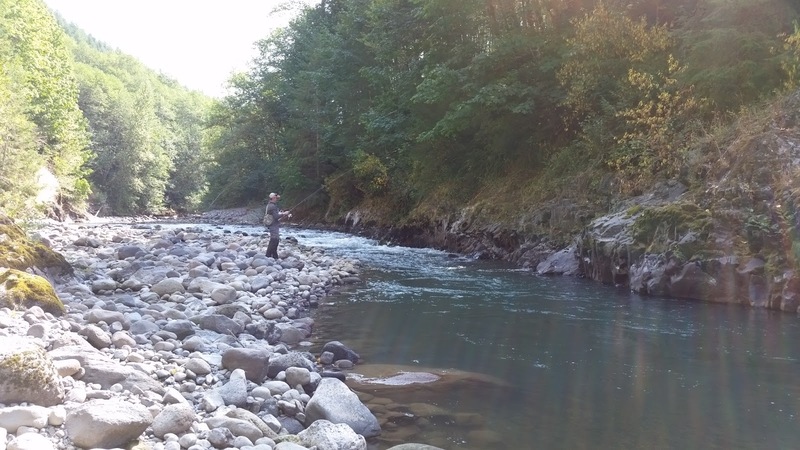 For this stream, both of those fish were trophy steelhead. Given that the uncharacteristic hits had happened twice in the same run, we had decided during the fight that we would examine the jaw once we landed it. My hook was planted in the upper jaw, but there was a mark on the lower lip. Was it Joe's? Did that fish hit twice? The evidence pointed toward the conclusion that we had shared this fish. I doubt if I've ever had a steelhead hit twice. 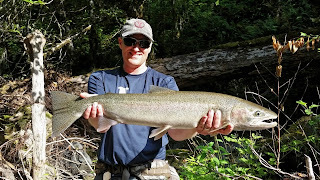 For the third time today the hooked steelhead could have been either of ours. We fished a few more hours of creek, then hiked out in the twilight and reached the truck without having to use flashlights. A few miles later we located and loaded the four-wheeler. It had been a long day, but such a fine day. The feet were sore, but we were beaming. Joe had not landed one this day, but when fishing in pairs steelheading is more of a collective effort. Both folks have to maintain resolve. If one person gives in to the nagging mental temptations to ease up or quit, the effort unravels. We had fished twelve-plus hours for a total of four or five hits. 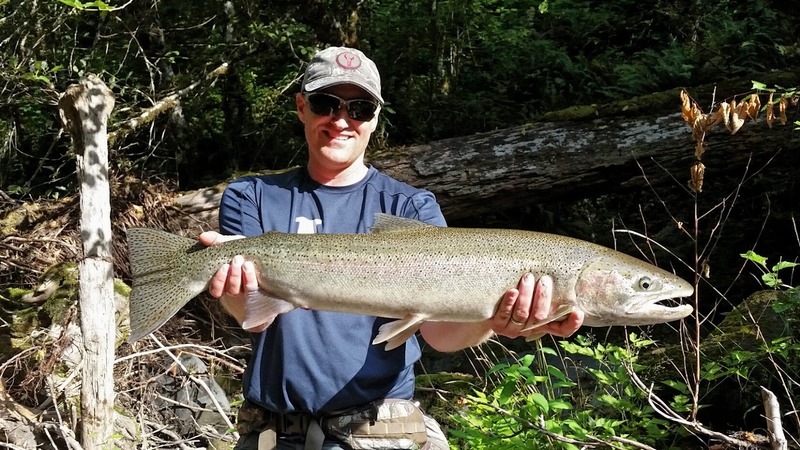 That is steelhead fishing, and who could ask for a better day of it.